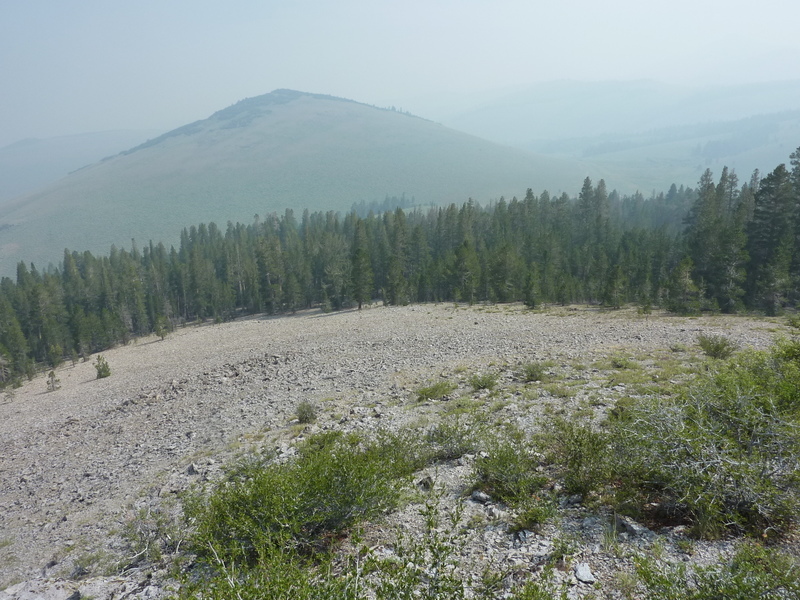 With a free day in the Bridgeport area before the start of the Sierra Challenge, I decided to head up to the Sweetwater Range to tag a handful of unnamed summits, none of them particularly outstanding. The highest, Peak 10,452ft, lands on the oddly-designed "Calfornia non-Sierra 10,000-foot summits" list. I've got a few of these left to complete, so this was an excuse to whittle away at it. It was more of a driving exercise in the Jeep than a hike, highly enjoyable save for the crappy views due to the fires in and around Yosemite. None of the peaks required a hike of even half a mile, so I've included the hiking and driving in one GPX file. The main road into the area is well-graded Burcham Flat Rd off US395 north of Bridgeport. Most cars can reach as high as Lobdell Lake, but various roads branching off from there require high-clearance. There were several herds of cattle lazing about, but otherwise I had the place to myself. Shortly before reaching Lobdell Lake, a spur road forks on the right, going up and around the west side of the summit. I parked where the road tops out (it continues south to a saddle and beyond, not shown on the topo map) and climbed easy scrub slopes 0.4mi to the open summit. There was a register left by Paul Garry in 2015. All of the half dozen parties to sign in had at least one recognizeable name. The next three peaks are all past Lobdell Lake. Peak 9,380ft is furthest, with a moderate road going nearly over the summit. There is a small campsite where it comes closest, with about 100yds of hiking through open forest to the summit. The highest point is among some brush and rock, not terribly inviting. The middle of the three, Peak 9,558ft has no road going up it, but one does pass within 0.35mi on the southeast side. I parked here and went up the sagebrush slopes (no real bushwhacking, even when it gets thicker near the top). There was a small cairn at the highest rocks under a bush. There are open views to the north from the summit. This peak overlooks Lobdell Lake on its northwest side. A spur road gets one within 0.2mi of the summit on the northeast side. I parked where the road normally ends at a campsite, but motorcycle tracks can be seen climbing higher up the mountain. An easy hike, mostly through dry forest, gets one to the open summit. This one is the furthest south of the five, with a spur road starting well before Lobdell Lake. The spur road takes one within 0.2mi of the summit on the southwest side. The Forest Service has blocked off the continuing road to vehicle traffic, but it's easy to hike the sandy road to the open summit. There is another point 2/3mi to the south of nearly the same height. During my visit, this other point was under construction for additional telecom installations (there's already a cell tower on it), including a large crane, numerous trucks and a bevy of workers.